The privilege to voice your politics without fear of retribution is a far cry from reality for the groups of women secretly organizing against the GOP in deeply red states. Emily Van Duyn, a PhD student at the University of Texas at Austin, wrote about this phenomenon for the Washington Post, focusing specifically on her study of group of progressive women in rural Texas county that overwhelmingly went for Trump in 2016. The group, which she refers to as the “Community Women’s Group” (CWG), is comprised of 136 people and include local business owners and community leaders whose livelihoods would be destroyed if they—as Van Duyn puts it—come out of the Democratic closet. They even signed a confidentiality agreement before joining the CWG. But it’s not just ostracization that these women fear; it’s violence too, in a culture steeped in reverence for firearms. Some women of the CWG have, in fact, “come out.” They’ve officially registered as Democrats, attended protests, and bravely put out political signs on their front yards. Van Duyn spoke with one woman who joined a Knock Every Door campaign. But these are a handful of anomalies. Most of the organizers still largely work in secret, not ready to become blue blights in their communities, families, or jobs. Many remain hidden because they want to avoid social conflict and are even fearful of being openly progressive in their community. Some refuse pictures with other members of the group who are open Democrats. 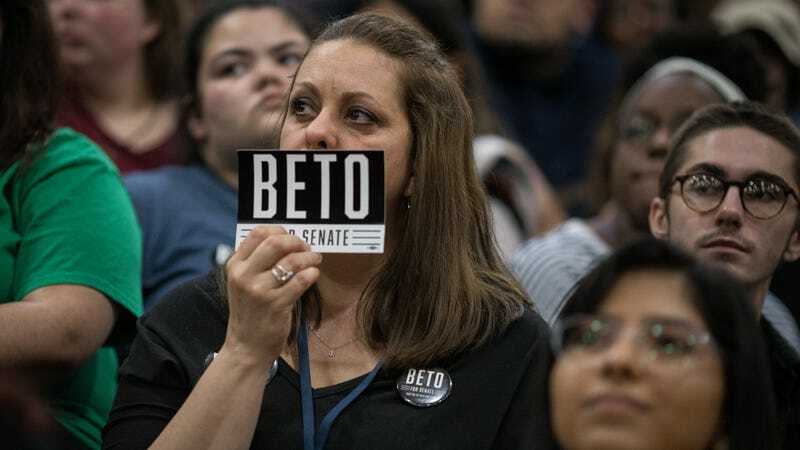 Some voted for Senate candidate Beto O’Rourke in the midterms, drove home, and told no one outside the group that they had voted for a Democrat. Of course, getting hard numbers on the actual difference these secret networks are making is tough: they’re secret. However, when Van Duyn’s findings went public, she received a slew of correspondence from women organizers following a similar model as the CWG in their own communities of rural Kentucky and North Carolina. They shared tales of destroyed yard signs and verbal harassment, but Van Duyn says that the fact that knowing they’re in “good company”—with secret progressive women in far flung states and counties—makes a difference in their commitment to continue their work. The fascination with the White Woman Voter in a Trump world has dominated the news cycle in everything from midterm elections to miscellaneous Pennsylvania congressional runoffs. They’re a demographic that is notoriously finicky for Democrats to rely on, a fact that would only be a mild annoyance if they didn’t capture the attention of so many Democratic strategists: Their focus should be on non-voters and voters of color, not Karen, the white suburban mom who still doesn’t know how she feels about Trump, but likes his regressive approach to immigration. But if any white women deserve attention, it’s the ones who fear political violence and ruin if their true political alliances are revealed. What does this political moment mean for them? How are they supported? And how can they convince the Karens of the world to join them?